I'm Alan. 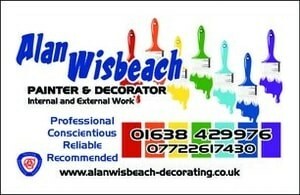 A proud professional painter & decorator based near Newmarket. I'm a friendly courteous guy who does my upmost to achieve a new fresh look for your home. I've had my own business for seven years now and have over twenty years served in the trade. I have great communication and I work alone so I don't have the worry of checking other peoples work. Having a keen eye for detail in all the work I carry out, so everything has to be just right. I cover both interior and exterior work and i also provide a quality wallpapering Service. Painting of one room to a whole house throughout to your convenience. Always being respectable of properties and belongings I work around using thorough sheeting and plastic covering are laid down at all times. "Thorough Preparation is always the Key to a great job". Thank you for taking time reading my profile, i look forward to your call. Newmarket, Cambridge, Ely, Bury Saint Edmund's, Mildenhall, Lakenheath &amp; all Surrounding Villages.